Do artists feel connected to the coverage of arts in the major arts publications and other media? Are these publications out of touch with the majority of working artists? Many times the articles in these journals seem to be very novelty oriented. At other times, they can have a general air of elitism separated from most working artists. Connecting these publications and other media outlets with working artists would be a good thing. One arts journalist would like to know what artists and others interested in the arts think. In so doing, this journalist is asking for input from her potential audience. Chloe Veltman of ArtsJournal.com would like to hear from the arts listeners to Colorado’s NPR. In an article on her Lies like Truth blog, she puts forth an argument for more transparency on arts journalism. She has a survey in her article to uncover what others would like to see in arts reporting. That’s refreshing! Having a connection to what is covered in arts journalism would be nice. However, most artists today are carrying on without it. Artists continue to do what they do best whether or not any of the establishment types are paying attention. Most artists are concerned with creating art. If anybody is listening that’s grand. If they aren’t, artists will still be creating art. Artists just want to make art but it never hurts to speak up when the opportunity presents itself. You never know when a connection might happen. This entry was posted in art, art news, Painting, Uncategorized and tagged Art, Art News, ArtsJournal. Bookmark the permalink. The painting(?) at the top is beautiful. Is it yours? The professor is quite impressed. Very well done. Thanks! 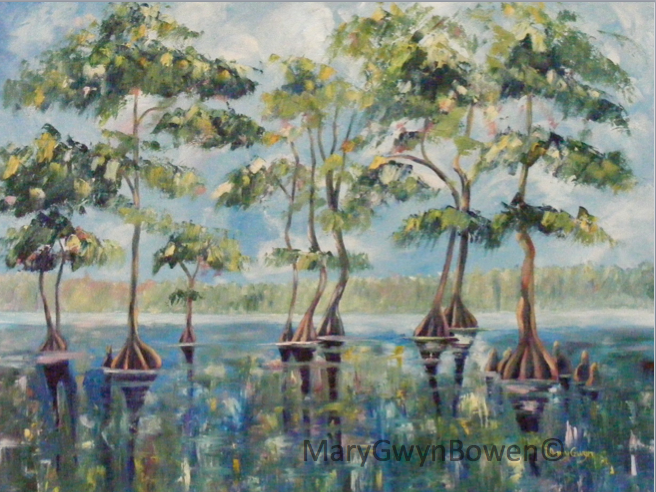 These are just common cypress trees(taxodium) growing in Reelfoot Lake in West Tennessee. Cypress trees have a vast ecosystem that lives within their root system but they aren’t the “walking trees” of the Amazon. I am intrigued with how spooky they look growing out of the water. They almost look like they’re walking. Or dancing! I love dropping by Melanie’s Crossroads! Looking forward to your posts in 2014!